Evergreen Lodge epitomises tranquillity. Located on the western edge of Yosemite National Park, the ecolodge offers private cabins and a campsite to guests who want to hike, bike, raft, fly fish or go bear-spotting. There is even a weekly ping-pong tournament. But what makes Evergreen Lodge unique is not its natural beauty or on-site entertainment - it is that its profits go to support a youth development programme. Paid interns, all young people from inner cities, work at the lodge for five to six months. During that time they gain job skills and receive counselling and career advice. The lodge offers this programme thanks to a loan from The Calvert Foundation, a non-profit foundation that relies entirely on funding from socially minded investors. Wealthy investors helped bring the microfinance sector to scale by boosting liquidity and giving credence to early-stage initiatives. Now funds that are lending cash to innovative projects, such as Evergreen's, hope that, with the support of the high net worth market, the success of microfinance can be replicated in other parts of the same community investment market. 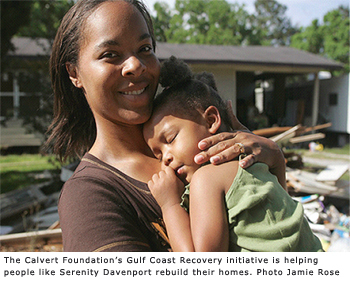 The Calvert Foundation's Gulf Coast Recovery initiative is helping people like Serenity Davenport rebuild their homes. Photo Jamie Rose "It's taken microfinance to get people's attention about using investment as a tool to alleviate poverty, but actually there are a lot of applications for that concept," says Shari Berenbach, executive director of The Calvert Foundation. Opportunities for the high net worth market to fund community development projects in the US and overseas are increasing all the time and, as in microfinance, it is wealthy individuals and families who are being approached to support pioneering initiatives and assume the most risk. Take Eye Fund I, Deutsche Bank's new $20m fund to lend cash to eye hospitals in the developing world, launched with the International Association to Prevent Blindness and Ashoka, a non-profit that supports individuals bringing social change to their communities. Its aim is simple: to help reduce the number of blind and visually impaired people worldwide, 75 per cent of whom could be treated. The target organisations are hospitals that operate self-supporting programmes, using fees from regular paying clients to subsidise treatment of impoverished patients. Eye Fund I will initially provide low-cost loans to seven hospitals in India, China, Nigeria, Paraguay and South Africa, which will allow them to treat more patients and increase the scale of their programmes to help the poor. The bank is about to start fundraising and intends to close the fund by the end of the year. The fund, which is supported by a $2m grant from development agencies, will include $14m of senior debt, offering a 6 per cent return, and a subordinated debt portion of $4m, offering a 1 per cent return, which Deutsche hopes will be bought by socially minded individual investors. Gary Hattem, head of the community development finance group at Deutsche Bank, says it is critical for wealthy individuals to take on more risk in this fund to support a good cause, particularly when institutional investors are constrained by fiduciary requirements about the risks - and returns - they can take. "High net worth investors are crucial to the structure because they can take a higher risk and support the senior debt portion, which allows institutional investors to participate," he says. The Eye Fund looks, on the surface at least, to be a reasonably risky proposition. There is no record for how these types of loans will fare, and no liquidity, and this will be the first time the hospitals involved have taken on debt. "There is weak cash flow and no history of investment, so the perception of risk is far greater than it actually is," says Asad Mahmood, the bank's managing director of global social investment funds. Nevertheless, as in any nascent market, there are bound to be risks. Information is hard to come by and research is labour-intensive. The Calvert Foundation, for example, has been investing in community projects for 10 years, and has a loss rate of less than 0.2 per cent. 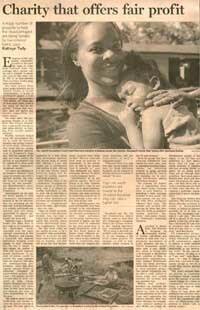 But, as Hattem points out, scale and liquidity have been brought to the microfinance market only because individual investors participated in early stage initiatives, encouraging institutional investors to follow, and this success could be replicated in the next generation of social investments, such as the Eye Fund. Indeed, he thinks many different sectors could be funded in this way, which is why Deutsche Bank is considering other funds that will support education initiatives, and new technologies as well as renewable energy. "Wherever there is a cash flow that can be repaid with debt, we think individual investors can be catalytic in helping these new sectors to emerge," he says. Berenbach says The Calvert Foundation, which already lends to more than 200 community organisations in the US and overseas, is also funding innovative new community projects. "We've tried to diversify our portfolio a bit more recently, so we are funding a fair trade coffee project, for example, as well as independent media projects in the US and overseas." Even the groups that have attracted commercial loan capital for some time, such as affordable housing organisations, are developing projects to tackle growing problems in the US, such as the alarming rise in mortgage foreclosures among low-income families. For example, the Federation of Appalachian Housing, which makes mortgage loans to poor families, is launching a retail mortgage business to help people who have recently run into trouble with their mortgages refinance their loans. "The scheme will provide refinancing for those that have been the victim of predatory lending practices elsewhere," says Jenna Urusky, the Federation's marketing executive. According to Berenbach, that diversity is bringing an increasing number of wealthy individuals and families to their door. For a minimum investment of $1,000, investors can buy a Calvert Community investment note, a one-, three-, five-, seven- or 10-year note to be invested in the foundation's portfolio of loans to microcredit organisations, small business development units and those providing community facilities as well as social enterprise groups. The Calvert Foundation also provides a credit cushion of about $12m that stands between the investor and any potential loss. Within that portfolio, investors can nominate the sector or region they want to invest in, such as those groups operating on the Gulf Coast and supporting the region's recovery after Hurricane Katrina, for example. "Any investor coming in with $1,000 can target the international market or the region of the US they are interested in," says Berenbach. "But for high net worth investors or families who are investing $50,000 or more, we sit down with them and go through their priorities - how much microfinance they want and how many US projects, for example - and then we're able to craft a portfolio and get back to them. They can even recommend a particular organisation that is not in our portfolio". Like Deutsche Bank's new initiative, The Calvert Foundation also asks investors to accept a below-market return, or indeed no interest payment at all if they so choose. The maximum available is 3 per cent. "We live off of a spread of 150 basis points. In the US, we're paying a maximum of 3 per cent to investors and we lend here at 4 per cent to 4.5 per cent," says Berenbach. US community groups, which have a long history of being subsidised by non-profit organisations, expect to borrow at lower interest rates than microfinance institutions in the developing world. "In the microfinance market, we lend at 6 or 7 per cent," says Berenbach. "If I was to charge more than 4 per cent to community groups in the US, I would have trouble placing the funds." That hasn't stopped interest growing in community investment funds. Indeed, given the amount of private capital looking for a home in commercial microfinance funds, it may pay to look outside this arena. There are only about 200 profitable microfinance institutions in the world that can absorb the commercial capital at all, which means competition to deploy cash is getting intense.